This year will see the release of the sequel to 2010's Planechase product... and, like last year's Commander extravabonanza, these sets will feature all new cards. Even better, the decks contain some awesome new legends, since Commander and Planechase go great together. Tonight, we've got a literal pair of preview legends for you, ready to step up and command your decks. Since we couldn't decide who on the RC was most excited about these, we're all gonna pile on and share our thoughts and excitement! SHELDON: Krond’s favorite Enchantment is Rancor. No, wait—Shield of the Oversoul. Or a million others. Any way you slice it, exiling stuff is the best way to get rid of stuff for good. Maybe there’s a Dawn-themed deck just waiting to get made. GAVIN: Oouf. I love offensive creatures which also play defense, and this guy simultaneously blocks heavy and runs interference for you when enchanted. The downside is that he dies easy, compared to Sigarda for example, which doesn't synergise well with Auras... but his third ability is much more fun and relevant. I'm looking forward to putting Elemental Resonance on this guy. TOBY:The first thing I always do with creatures that want to be enchanted is check their power. Is it 6? Yes! That makes Dragon Fangs and Dragon Scales go-to candidates for automatically piling on to this guy. ALEX: Krond rivals Bruna for "Best Commander to play with Vow of Duty". A fine choice for a deck, if you want to play Uril but can't remember where you put your Mountains. GAVIN: This gal is going to be the belle of Okiba-gang's annual staff party. Ninjas, Specters, you name it... blue/black has a stable of good saboteur effects happy to cloak themselves in Vela's shimmering, smokey train. Add in a battery of bounce spells and Vela could be one of the most interactive commanders we've seen in a long time. TOBY: Intimidate gets weaker the more colors you have, but nobody is going to be playing her to be getting through. Clearly designed to work with ninjas, but were all those blue flicker effects in AVR just plants for this? Devastation Tide seems a little more interesting if it's doing half a dozen damage to each opponent on the side. ALEX: Vela's a pretty cool choice for a black/blue aggro list. You lose some synergies that Grimgrin or Sygg, River Cutthroat have, but you get to punish opponents for wrathing you, and gain some cute stuff like Shrieking Drake fireballs and the best Tombstone Stairwell in the game. She's obviously got a lot of infinite combo potential too, but I ain't touching that. SHELDON: Vela dares you to kill her friends. Or bounce them. Clearly a little crazy with Cloudstone Curio. We'll see how the Intimidate works out, but all of your guys being partially unblockable seems okay. Remember: Most legendary creatures have a gender, and most non-legendary ones don't! Use proper pronouns! I think I have a new deck in the works (Night) but Krond will just have to squeeze into Uril, having decks based on both of them would be tiresome. Both are not really my cup of tea, although Vela might make it into my Damia deck which is creature only. Nice creatures, not exciting enough for me to play as a general. 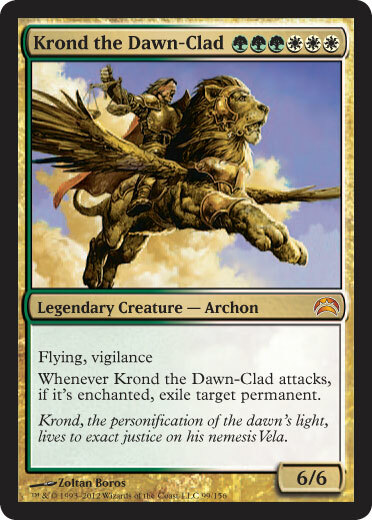 Like LovesTha, I'll put Krond in my Uril deck. It's actually quite perfect since I've been converting it from enchantress to stand alone bombs and auras. Vela seems really bland in my opinion. Ok, giving everyone Intimidate is kind of nice and fits the flavor of being Night-clad. It also works really well with those colors since I've been thinking of building a combat damage -based deck which causes opponents to discard and/or me to draw whenever I connect. She'd be the perfect general if I didn't hate her art and second effect. And regarding it... How does a legend have a worse version of an effect we've seen twice in the last set alone? It's not very unique-feeling. It doesn't feel legendary at all. Vela would have been awesome if she gave all your creature intimidate and Ophidian instead. I like her more as is. Not all puzzles should come pre-solved. The UB one makes little sense to me, considering a good chunk of Blue and Black creatures are expensive or inefficient. Krond is just so derpy and simple it's silly to me. Oh, I like Vela. Fun build-around. Great with Killing Wave and Blood Artist. I like that she pings everyone. What can I say? I liked the design of Shadowmage Infiltrator. Krond has that stupid "intervening if." When will WotC get rid of that thing? Anyway, if you attack with him, then an opponent casts Fracturing Gust in response to the trigger, the ability will do nothing upon resolution. Also if you attack before he's enchanted, then use Nomad Mythmaker to put Faith's Fetters on him, the ability won't be on the stack and so you miss the benefit that way, too. What a stupid rule. Otherwise, nice design. It'll be added to the list, for sure. But that's actually an unnecessary way to cost him, in my opinion. Eh, whatever. Vela is very cool. Evacuation and Cowardice were already good in just about any deck with blue, but in this one they are amazing. Also Deadeye Navigator. As for the mass intimidate, I guess it's good with with Arcbound Slith. There aren't a lot of colorless creatures that care about being unblockable. Going the other direction, I would load her up with black and blue creatures with combat damage triggers, then throw in Thran Lens. Vela tag-teams with both of Grimgrin, Corpse-Born's abilities very well. Might be time to take Soulquake or Spinal Embrace out of the binder. Wydwen, the Biting Gale goes in this deck. 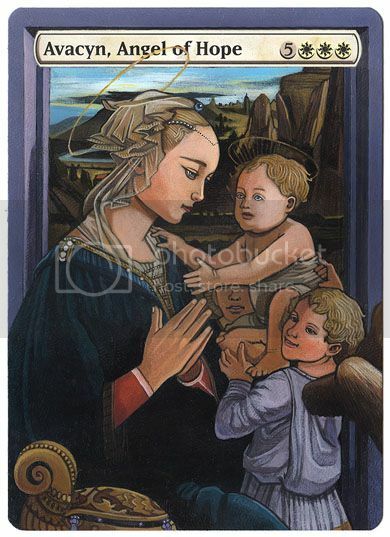 I like the idea of a blue-black artifact deck with her. Add Time Sieve and Tezzeret, Agent of Bolas. Another artifact creature that cares about dealing combat damage to a player: Sharding Sphinx. I guess granting intimidate is useful on a UB general since UB's creatures are all either anemic or cost eleventy billion mana. That said, neither of these excite me; Krond is a distant third to Bubbles and Uril in the Voltron Aura General department and Vela is just kinda meh. I mean, sure, unblockable, but I wouldn't want to be a creature deck in straight UB: those colors are better suited for control or combo than brawling. I will be making a deck for her. Vela is ... so beautiful. Vela is amazing- the ability is intriguing and the flavor is awesome. I'm going to literally start building this deck today! Dammit... 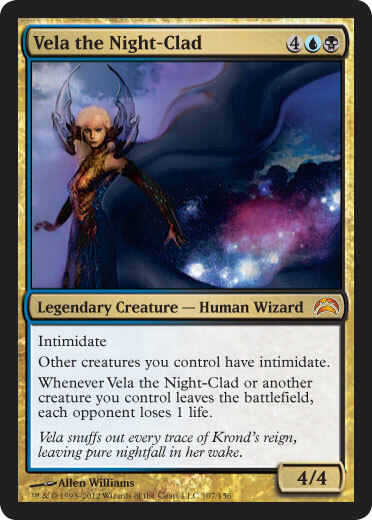 I really want to make an deck with Krond.... but Vela may just be the general for my future Magistrate deck (to go opposite Bosh).